Bloggers love to spend money. “You need to invest in your blog” is a popular piece of advice. But what should you spend money on? Where can you spend cash that will help you grow the fastest? Investing in your blog or business = good. Wasting money on low-ROI activities or products = BAD. So, I asked around the blogosphere and compiled some incredibly useful answers! What should new bloggers spend money on, if at all? Important Note: For the sake of this conversation, I am not counting initial domain and hosting expenses. Whether it’s $60 on Bluehost or $150 on Siteground, I’m NOT counting that in the $1,000. First, I’d like to present a totally-unexpected-but-amazing assessment. By default–you should NOT spend your money based on what worked for other people. You should find what is going to bring YOU and YOUR BUSINESS a positive ROI. This comes from determining your strengths and figuring out how spending cash can play into those strengths. FYI – You can get more Nick True over at Mapped Out Money. If I wanted to invest in my blog–what are my options? There were several pieces of advice that came up repeatedly from folks. Hey, did you all know that there are blogging courses for sale via the internet? Ranging anywhere from $15 to $5,000+? I know. It’s hard to believe that new bloggers (those in their first 0-12 months) would spend so much on their blogging education–but they do. Courses are NOT a magic bullet to grow your blog/biz. Understanding what you need and don’t need. If you lack any one of those three, you should not blindly spend money on blogging courses. …or they could be unnecessary expenses. It’s insane how much you can spend when you start adding up blogging tools. Let’s be crystal clear: you can absolutely CRUSH your first year of blogging using ONLY free tools. Mailchimp is free to 2,000 subscribers, and has made HUGE updates recently with regards to their tagging and segmenting systems, landing pages, and even advanced automation. It’s MORE than enough for new bloggers (and I’d argue all bloggers). Stop thinking you need more things to grow. New bloggers who are not really well-off financially or have little experience RUNNING ads–shouldn’t run ads. You’re blowing your hard-earned cash. Learn how to properly run ads, get monetized, then run ads. Blogging, marketing, and niche-specific meetups and conferences can be game-changers. But can they be positive-ROI business-changers? connecting with like-minded folks is HUGE. I gotta go with Josh on this: Everybody needs a Penny. Their benefits are less obvious. The truth is, the benefits of having off-line experiences and relationships extends far beyond easily-trackable revenue. You can’t attach these to a monetary amount. Conferences (and local meetups) can lead to many intangible opportunities for growth (and might actually provide the difference between quitting and not quitting). I’d argue that’s high-ROI, but there’s a catch. I feel pretty strongly about this, so I’m going to break it out by time. In my massive guide for new bloggers–you might notice I talk very little about paid products for your first few months. I truthfully believe brand new bloggers should not spend a dime on anything in their first 6 months. Again, aside from initial hosting and domain. You don’t know what you need yet. This goes back to what Nick said about playing to your strengths–there’s almost no way you can correctly identify your blogging strengths and weaknesses when you first start. It’s going to take to figure out exactly what will grow your blog best–both paid and free. Note: Did I violate this in my first six months? I ab-so-LUTE-ly did. But looking back–I’m pretty sure I’d be EXACTLY where I am today if I had stuck to free tools, no ads, etc for the first 6 months. Also, your blog is probably not monetized during this phase. I’m ok with spending a bit without a solid monetization strategy in place–but the more expenses that ramp up, the more I think you NEED to be monetized before you scale to spending $250/mo, $500/mo, or more. 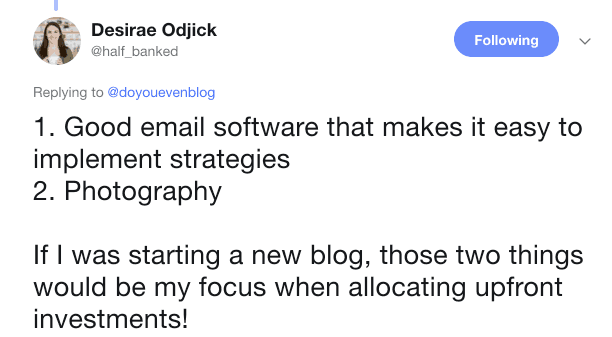 If you have blogged somewhat consistently for 6 months, I’d argue you probably have a MUCH clearer idea of what might help take you to the next level. 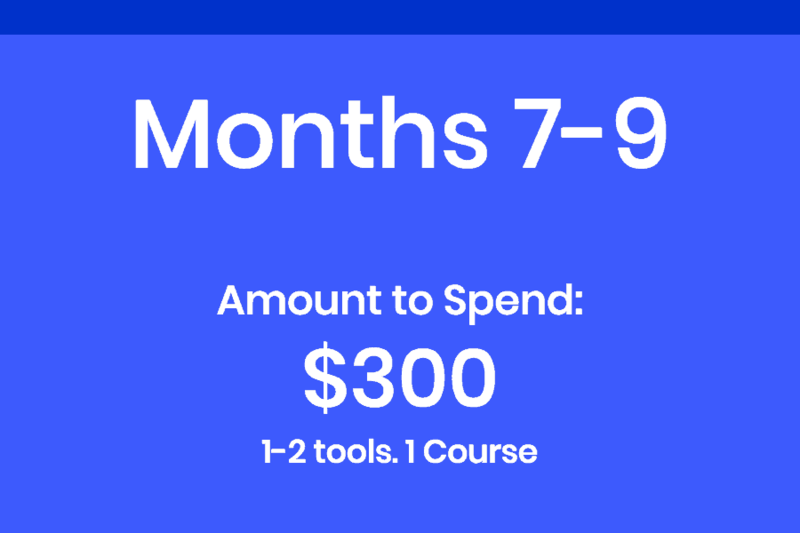 Note: When I say “1-2 tools,” I’m including 6 months worth of costs into the $300. I.e. 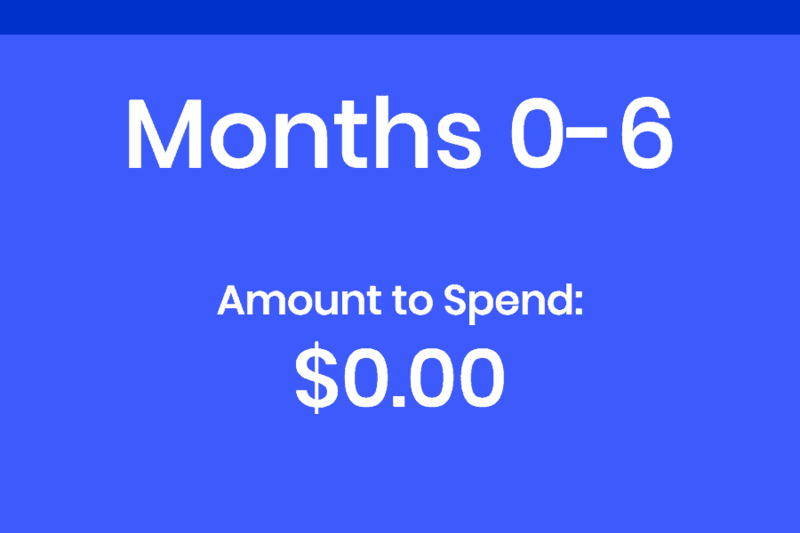 if you signed up for ConvertKit at month 6, I’m including 6 months worth of expenses in this to round out year 1. Pick one smaller, topic-specific course. It’s up to you, but I’d highly recommend it be directly aligned with either a growth strategy or monetization strategy. In other words, something mandatory for direct growth or making money. ConvertKit = NO. Mailchimp is more than enough still. Sorry! SmarterQueue or Tailwind = Maybe. These are almost mandatory for marketing purposes. Still, there’s Buffer for free. SEO tool of which = Maybe. This is almost mandatory for accelerated SEO growth. 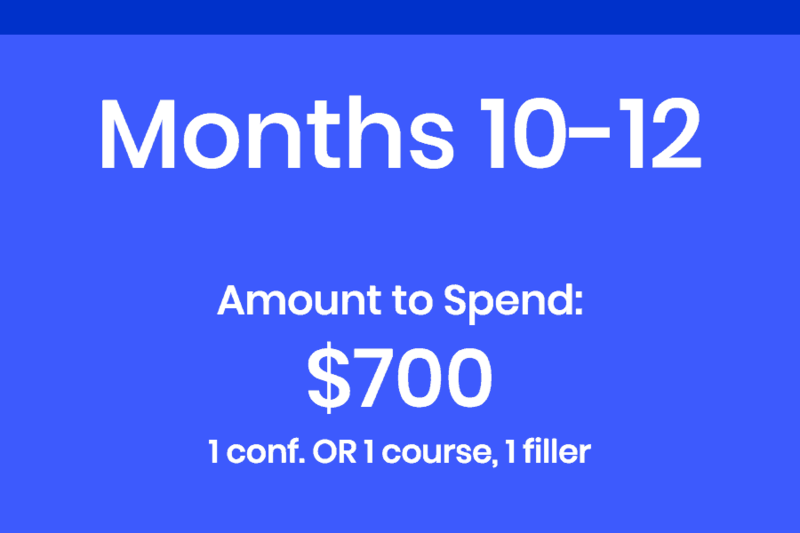 I do NOT think you should spend more than $100 on a blogging course in month 6. Just don’t. To be honest–this is part of my reasoning behind splitting Blogger U up into separate, topic-specific courses at smaller price points. I seriously just think it’s a smarter move for new bloggers. So rather than grabbing a generic “grow your blog” course, find a course that suits your strategy and strengths. Spend months 0-9 learning more about yourself and your blog. After that, the chance of spending $1,000 and having it grow your blog–grows exponentially for a while. Do I think bloggers should switch from free platforms to paid platforms for incremental gains? Unless you’re heavily monetized already (some people are), or really have a specific need tools-wise, I’d argue there’s very little need to move away from free tools. Once you’ve taken the time to “find your position” in the blogging world–especially from a money-making business standpoint, I believe you should double-down on either a conference or larger blogging course(s). It’s at this point that a conference OR course will likely bring more ROI for growth and monetization that anything else. Again, Nick already outlined this. 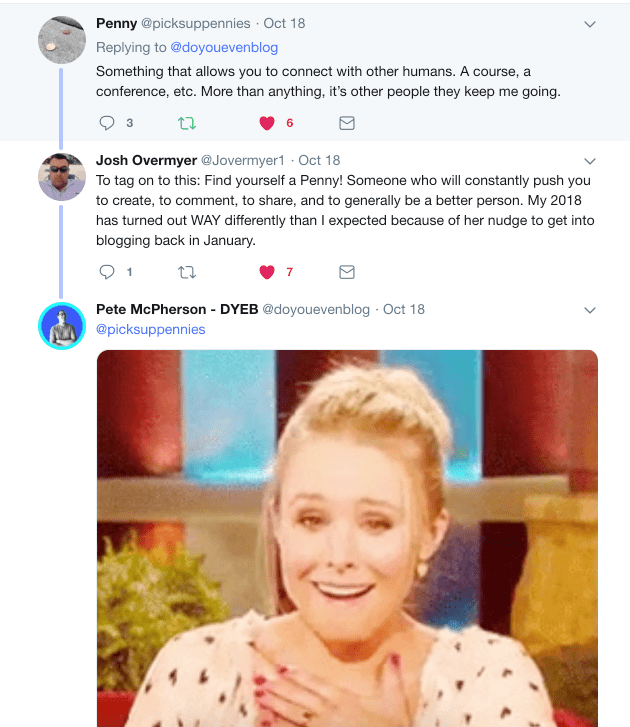 If you’re a bomb networker, know how to stand out and make connections at conferences, or otherwise need in-person interactions for another reason (like seeking freelance clients–always works way better in person), then choose a conference. Note: For anybody OUTSIDE of the digital marketing niches, I’d suggest finding niche-specific conferences! I.e. if you’re a travel blogger, go to either a travel conference or travel blogger conference–not social media marketing world. 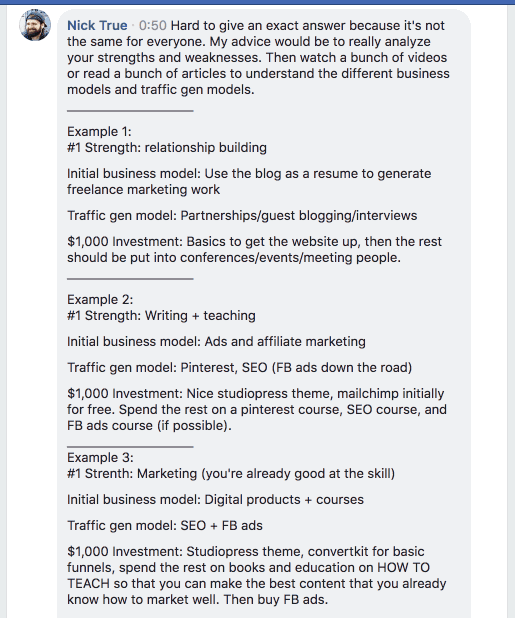 It’s at this point where you should try and find a “bundle” course that covers more than 1 specific marketing aspect. 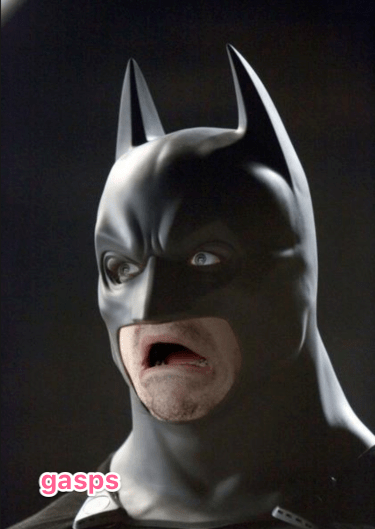 10K subs. EBA. Blogger U. Billionaire Blog Club. Tribes. Platform University. While all of these are slightly different, they have one thing in common: they are more than online courses. They’re communities and learning platforms that will help you grow beyond one specific topic or strategy. Bottom Line: Be thoughtful about how your blogging expenses help you grow. You should NOT spend money on FinCon just because you’ve heard it’s cool (though it is). You should NOT upgrade to ConvertKit or Drip when you hear me raving about them–but you don’t really have the need for them yet. You should NOT jump in for the full Blogger U membership bundle without a clear vision of how it’ll help you grow. Or because my perfect sales copywriting & persuasion techniques. Those expensive tools, courses, and conferences will never make up for a lack of remarkable content, effort, or old-fashioned relentlessness. Recently, I decided to blog full-time and I made a list of all the courses I would possibly need to help grow my blog. This list included Michelle’s Making sense of Affiliate marketing, Ruth’s EBA, Lena’s Traffic transformation guide and others. When I looked at my PayPal account, I knew I didn’t have all that money to purchase all those courses. So, I settled for an affiliate marketing course of $37 and a Pinterest course for $32. I’m still implementing the strategies I learnt so I won’t be buying any courses or ebooks until I start making some money from my blog.